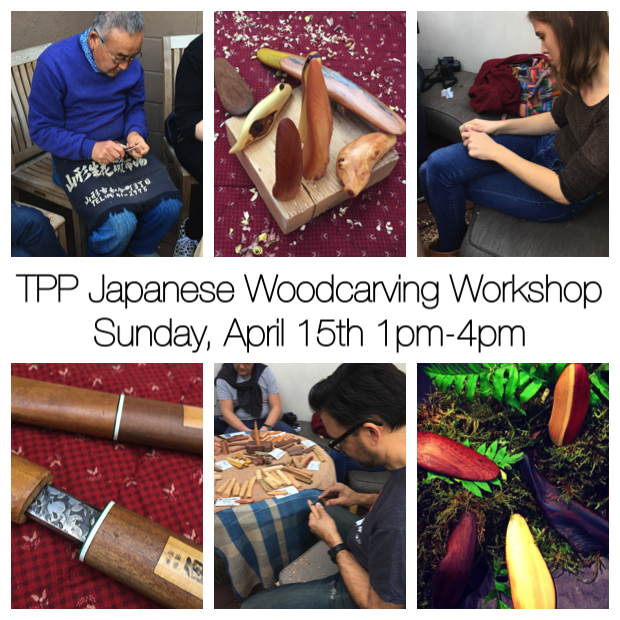 TPP Japanese Woodcarving Workshop Sunday, Sept.24th 1-4pm! Master Woodcarver Yo Takimoto is back from Japan and returns to The Plant Provocateur for another amazing Japanese Woodcarving Workshop. The workshop takes place on Sunday, September 24th from 1pm-4pm. Reserve your spot today as they tend to go fast! Yo teaches the meditative art of Japanese Kikezuri Woodcarving. The art of Kikezuri asks the participant to leave their intentions behind and allow the wood's nature to emerge. It's a very relaxing and surprisingly soothing process. If you haven't experienced this amazing workshop...here's your chance! Workshop participants are provided with wood at the time of the workshop, tools for carving, and instruction. You make and take what you carve. The workshop session is limited to 6 people. Class fee is $65 which includes all materials and instruction. Workshop session takes place on the patio at The Plant Provocateur. Event is 3 hours long. Tickets are available for purchase by clicking 'HERE' .